Being fairly new to the pepper growing aspect of gardening, I truly had no idea how many pepper plants to plant this year in order to yield enough peppers for canning, eating and cooking for one season. I knew I wanted enough peppers to can at least one quart for every month for the next year, but depending on the size of the peppers, the amount would vary. Two years ago I tried growing a few bell pepper plants with no success. Last year I planted only four pepper plants – two jalapeno and two green chili. Both yielded an unbelievable amount of peppers. I still have enough pickled jalapenos on the pantry shelves from last year for another year and the green chilies will get us through at least the fall and part of the winter. Learning that two peppers plants could yield so much, I was still not convinced that I would have that sort of luck in growing the white bell peppers I wanted this year. With one unsuccessful attempt and one successful attempt at pepper growing, this year I decided to plant a lot of plants, to stack the deck if you will, in my favor. Plus, I put plants in two separate areas around the house to see which area was more conducive to pepper growing. White bells are not sweet like a yellow, red, or orange bell. These peppers tend to be somewhat more mild with a touch of bitterness. I would use them in place of green pepper on tacos sooner than I would use them in place of any sweet pepper. These peppers are the ones I uses for pickling and what Hubby loves to eat raw all summer with dinner. 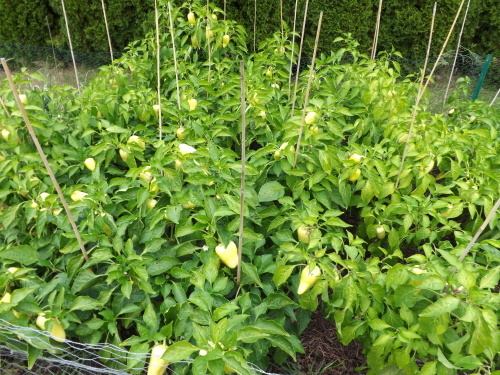 In the spring I planted a total of 40 white pepper plants – a combination of Szegedi, White Cloud, and Romanian peppers in cups April 1st. They sprouted April 11th and went into the ground outside sometime in early June. Twenty-five plants went in the back garden and fifteen went up front right next to the front porch. For just about a month I watched as my plants seemed to stall and linger in a state of limbo, not growing much at all. Then at the beginning of July they just seemed to take off. July 19th I picked my first pepper and was absolutely thrilled with all the flowers and tiny peppers on the plants. Immediately I began to dream of canning peppers and filling the pantry shelves. Check out my instructions and recipe for pickled peppers on Simply Grateful Canning – Pickling Peppers. Well, you know the old saying “Be careful what you wish for?” Yeah, I am never going to forget this old adage, that’s for sure. For three months I have harvested peppers. Some weeks I’d only get a few (pretty much all of July) but then starting the beginning of August, the peppers really started to come in. Every week I was canning peppers, sometimes twice a week. I would harvest 60 peppers at the beginning of the week and within a few days there were more to pick. I felt like I was a slave to the pepper mines. 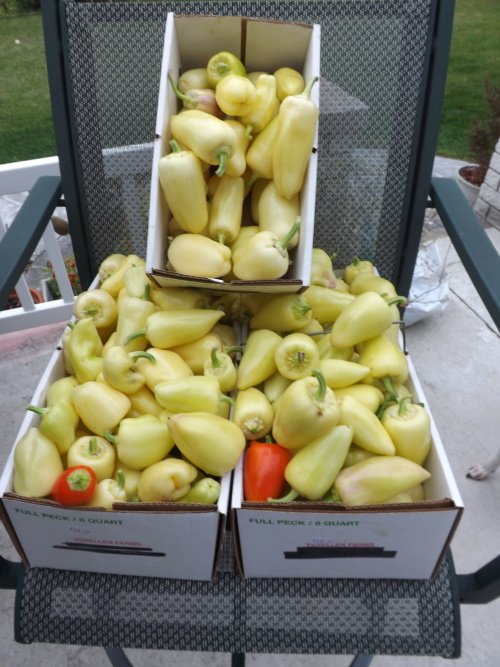 Last week, the first week in October I harvested the most ever in one picking – 225 peppers, bringing the total peppers picked for this year to 921. I am beginning to wonder if perhaps, just maybe, now I’m not absolutely certain, but it is possible, I planted just a few too many plants. I say this because although I practically cleaned every pepper off the plants regardless of how big they were last week, there are still flowers and tiny peppers just beginning to grow. If left to produce all fall, I bet I’d top the 1000 mark for peppers this year with no problem. This is what the pepper garden looks like this morning. No, no we do not. But I couldn’t even give enough of the peppers away to make a dent in the harvesting. After wallowing in self-pity for a few days while continuing to can though, I had an epiphany. 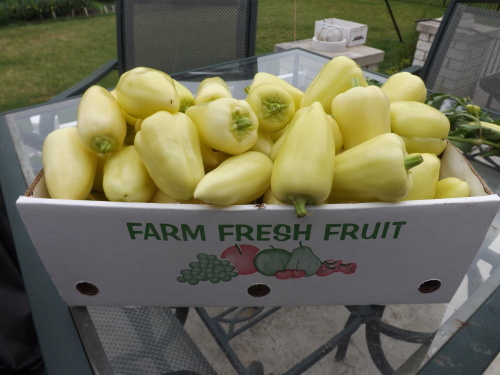 Canning this many white bells in one year would free up next year and possibly even the following one to concentrate my pepper growing to other varieties of peppers. Thus, a plan emerged. With the pantry shelves overflowing with pickled peppers, more than enough for at least two years, more likely three, next year I will concentrate on growing green chilies and red & yellow bells. My goal will be to grow enough to can green chilies for two to three years and freeze enough roasted red and raw yellow bells for at least two years. Then the following year I can grow jalapeno, green bells, and red chili peppers. Rotating crops every three years will give me a break from canning the same thing every year. — The Silver Lining! So, the question is: Did I plant too many pepper plants? The answer: If I didn’t can the peppers and they weren’t something that we definitely enjoy all year-long, then yes. But seeing as this is a staple in our refrigerator and something that will not go to waste, absolutely not. I do have to note here that the peppers in the back garden, yielded about 90% of the 900+ peppers that have been picked. Next year I will find a different crop to plant up front, rather than waste the space on peppers. Perhaps tomatoes or beans will do better there. As for this year, I’d have to say my pepper crop was definitely a success. I survived three months in the pepper mines, have more than 40 quarts of pickled peppers in the pantry, and for this I am (albeit exhausted) — Simply Grateful. 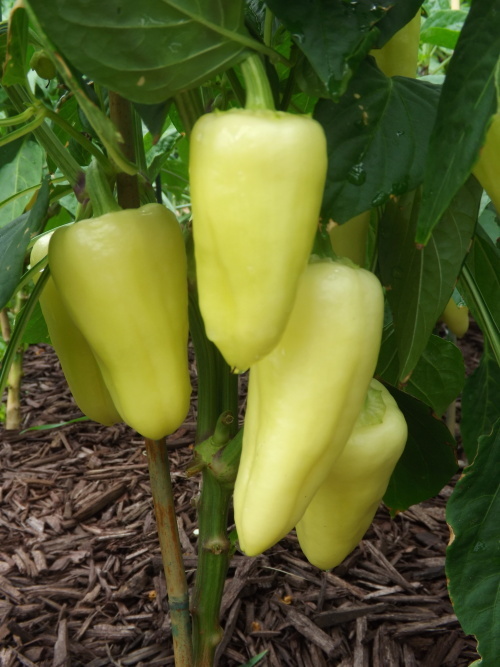 Categories: Peppers | Tags: Gardening, Peppers | Permalink.